Calcarea Fluroica 6X, Calcarea Phosphorica 3X, Calcarea Sulphurica 3X, Ferrum Phosphoricum 3X, Kali Muriticum 3X, Kali Phosphoricum 3X, Kali Sulphuricm 3X, Magnesia Phosphorica 3X, Natrum Muriaticum 6X, Natrum Phosphoricum 3X, Natrum Sulphuricum 3X, Silicea 6X in a base of Lactose USP. For relief of symptoms of colds, simple nervous tension, fatigue and headaches. Whether suffering from colds, headaches, nervous tension, or fatigue, your body may be lacking key minerals. 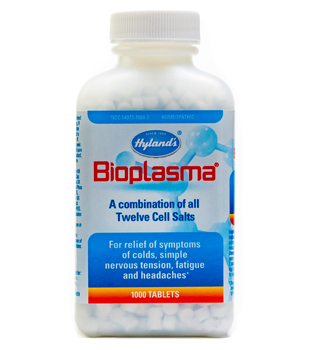 Each Hyland’s Bioplasma tablet contains the 12 cell salts that your system needs to restore a necessary balance that will bring relief. You can count on Hyland's for relief of symptoms of colds, simple nervous tension, fatigue and headaches. Tablets are flavorless and dissolve immediately without water for no upset stomach. Hyland’s Bioplasma helps bring balance to your body by providing a combination of the essential 12 mineral cell salts that are vital to cellular health and function. Cell salts satisfy mineral imbalances in the body, stimulating the body’s natural healing process. When your body lacks these important cell salts, you are more vulnerable to common health concerns. By replenishing them, your body is better prepared to treat illnesses and enjoy better overall wellness." Perhaps the most famous proteolytic enzyme in the world. Also known as wobenzyme. Fast relief for head banging. ProbioMood offers a clinically researched probiotic combination, designed to support emotional well-being and lessen occasional stress.